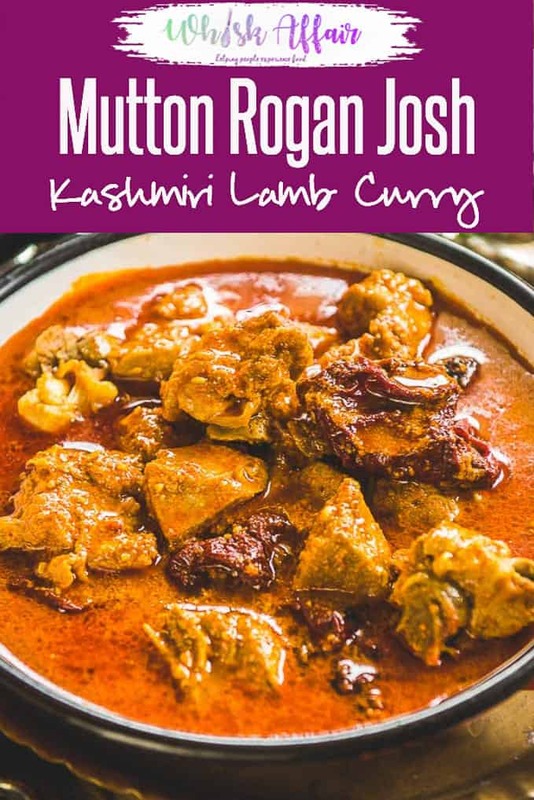 This Authentic Kashmiri Mutton Rogan Josh is a Kashmiri style Lamb Curry made with spices like fennel seeds and dry ginger. Spicy, loaded with yummy flavours this is a perfect easy to make curry to mop with some yummy loaf of bread. 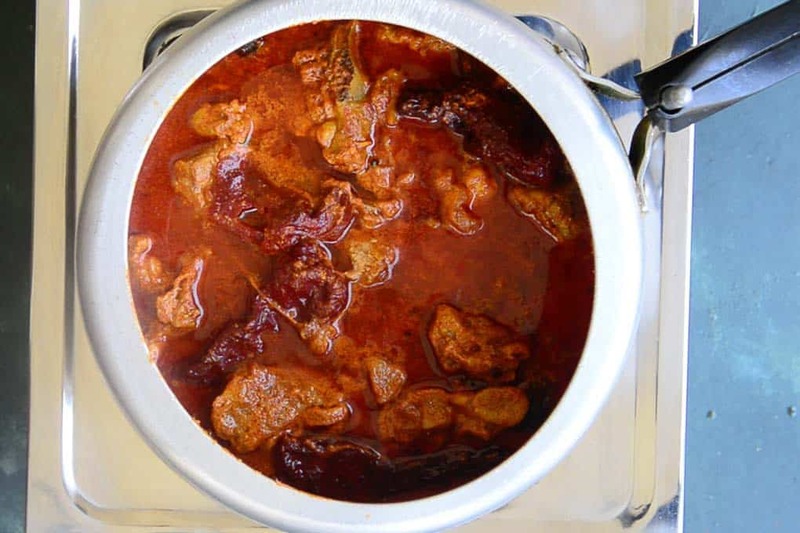 Here is how to make mutton rogan josh recipe with step by step pictures. Rogan Josh is a deep red spicy lamb or mutton dish of Persian origin. It was brought to Kashmir by the Mughals. The dish has a thin red coloured gravy and a thick layer of ghee on top. Serve with steamed rice or naan, it tastes delicious either ways. 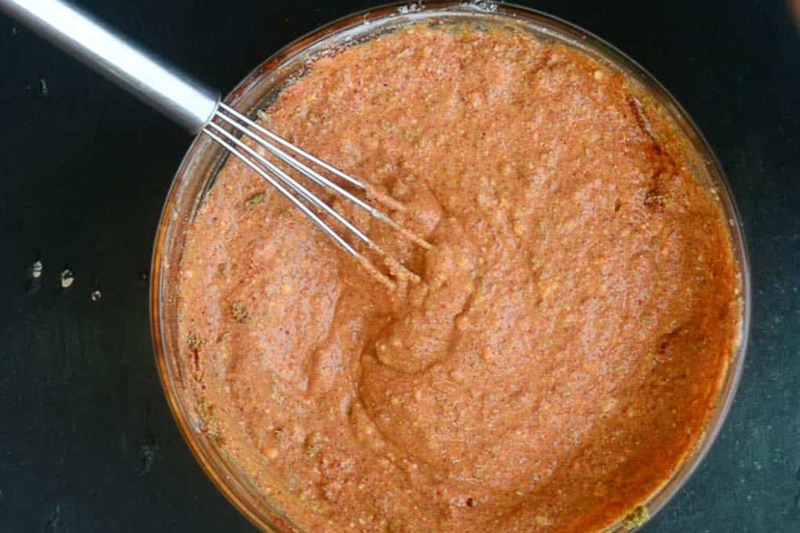 To make this rogan josh recipe, I have used little less ghee as compared to the authentic version but you choose to increase the amount of ghee. I can assure though that it tasted great with the amount of ghee I used. 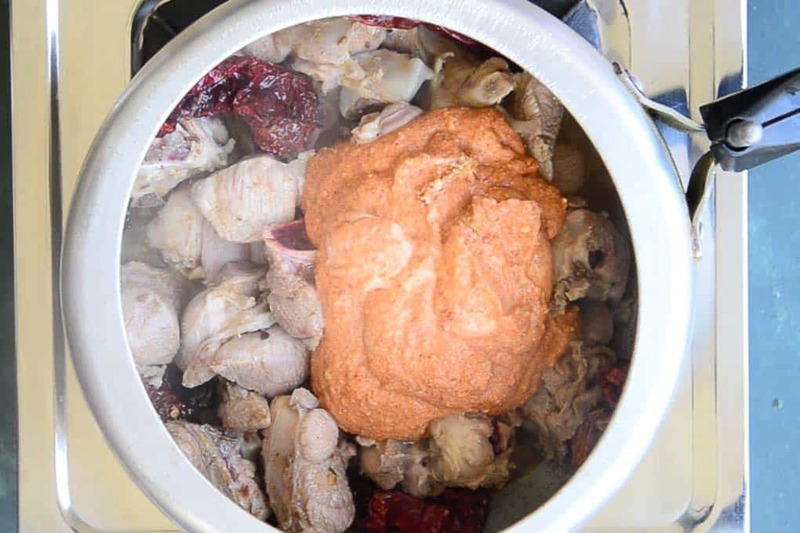 I have also cooked it in a pressure cooker to save time but in earlier days, it was the slow cooking process that made the lamb extremly tender. 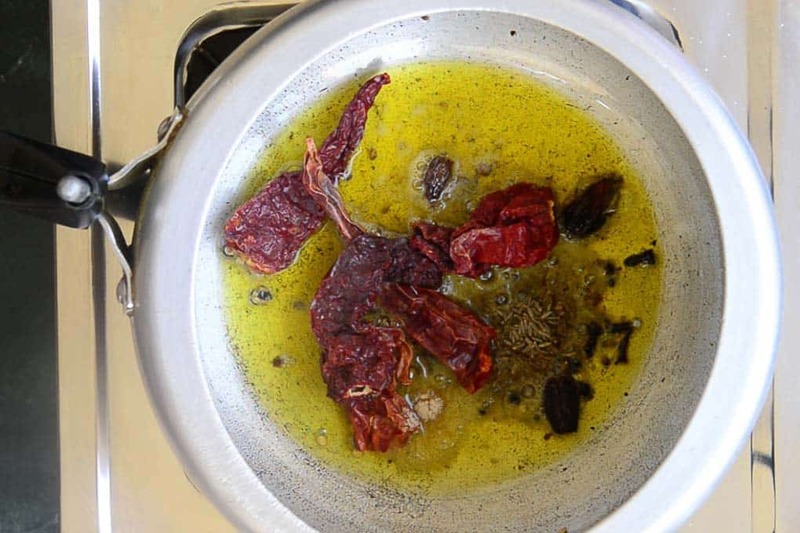 The characteristic red color of rogan josh comes from the use of liberal amount of Kashmiri red chilli powder and ratan jot which is root of a plants having a deep red color. If ratanjot is not available, you can skip using it. It doesn’t change the taste of the dish dramatically so it could be optional to use it. Infact, I too didn’t use it this time as I was short of it. 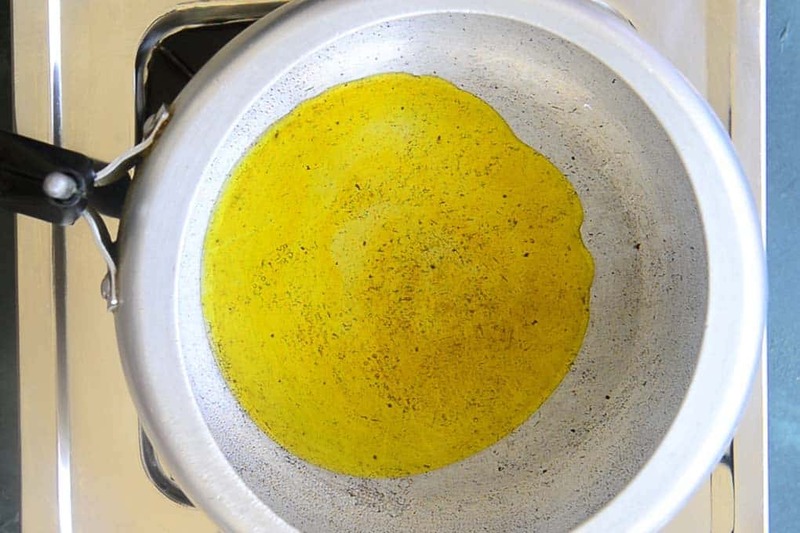 If using Ratanjot, heat 2 tbsp ghee and once the ghee is hot, switch off the flame and a small piece of ratanjot in the ghee. Let the colour of the ratanjot steep in the ghee for a few minute. Discard ratanjot and pour the ghee in the ready curry. Some people also use dry cockscomb flowers in their recipe. Soak 1 cup dried flowers in 1 cup warm water for 15-20 minutes. Strain and use the water in the recipe. It gives a very peculiar taste and color to the dish. There are two different versions of this dish. Kashmiri Muslims prepares it with onion and garlic while the Pandits use only yogurt to make it. I have made the Kashmiri Pandit’s version today with no onion and garlic and it turned out delicious. 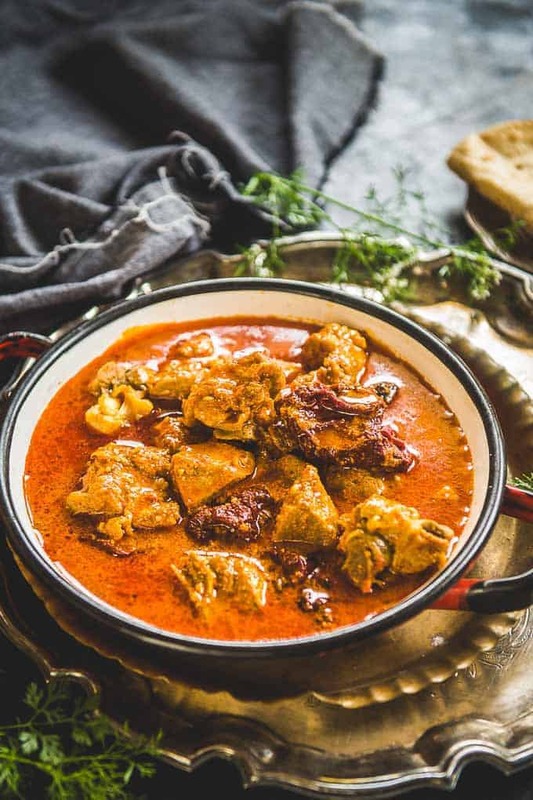 The bold flavour of spices like fennel seeds and dry ginger powder shone through the Kashmiri Rogan Josh and the meat fell off the bone while eating. Drooling right? We also drooled while the curry was underway and the charm of eating it was unmatchable. During many parties and gala dinners, I have served this Authentic Kashmiri Mutton Rogan Josh to my guests. This dish is such that any individual who loves feasting on non vegetarian delicacies will instantly fall in love with it. 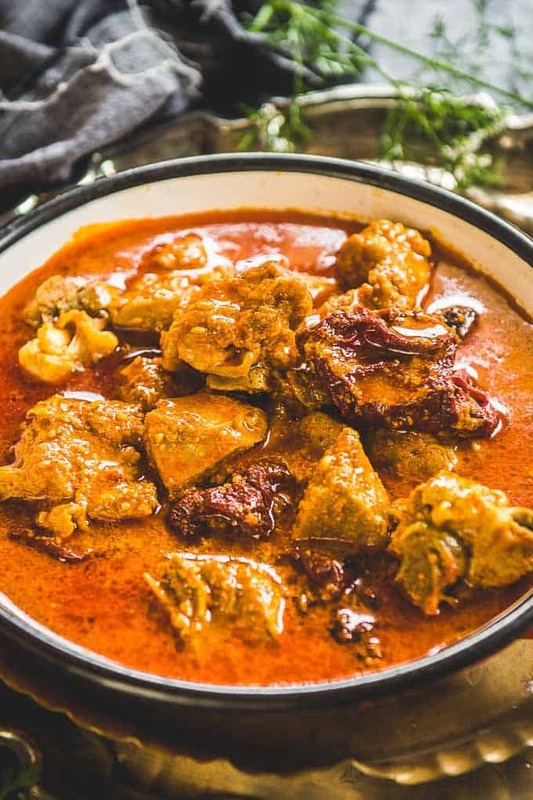 You can make versions of it like Lamb Rogan Josh or Chicken Rogan Josh, although traditionally it is always made with goat mutton. On some days, just to bring around some change on the dinner menu, I prepare Rogan Josh and surprise my family! Ladies, take a note of the recipe of Rogan Josh, who knows when you would end up preparing it, eh? How to thicken Rogan Josh? Ideally rogan josh is a thin watery gravy and that’s how it is traditionally made. But if you want to thicken the gravy, you can add 2 tbsp all purpose flour in the yogurt and whisk it well before adding in the pan. It will thicken the gravy and keep the taste intact. I have added just 1 tsp of maida to avoid separating of yogurt and not for thickeing the gravy. Does Rogan Josh have nuts in it? Rogan Josh doesn’t have any kind of nut in it. 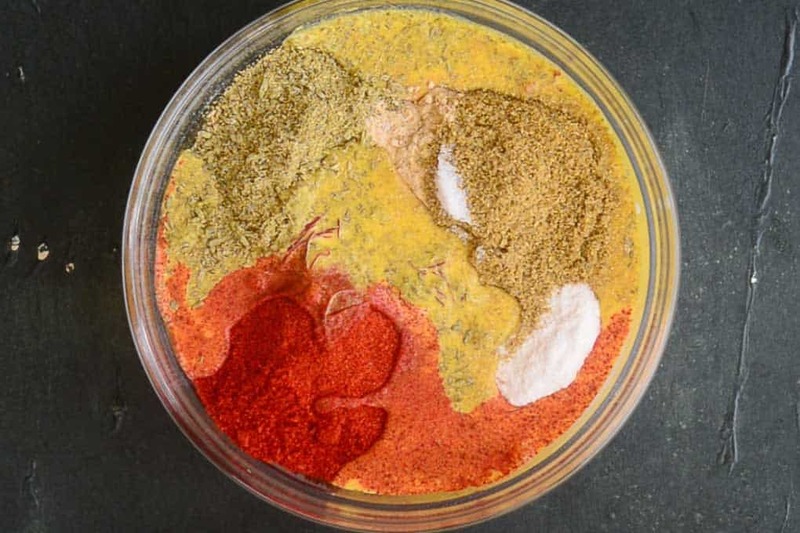 How to make Rogan Josh spice mix? To make Rogan Josh spice mix, 1/4 tsp hing, 2 tbsp Kashmiri red chilli powder, 3 tsp fennel powder, 1 tsp ginger powder and 1 tbsp coriander powder and mix well. Store this mix in a glass jar and use as required. 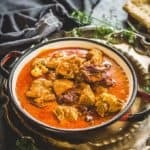 How to make Rogan Josh with onion and garlic like Kashmiri Muslims? 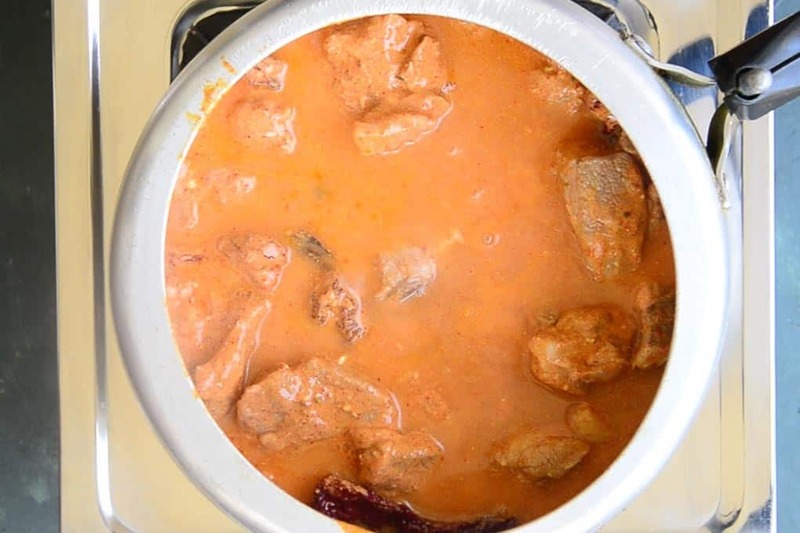 To make Mutton Rogan Josh recipe with onion and garlic like Kashmiri muslims, add sliced 1 cup onion and 10-12 crushed cloves of garlic in the pressure cooker after adding the dry red chillies. Fry them until they turn golden brown. Then add mutton and follow the recipe as mentioned below. Variations of Mutton Rogan Josh? Rogan Josh is a delicious curry and you can replace mutton in it with your choice of meat. Try using chicken, lamb or even beef to make this curry. Vegetarians can even try it with paneer or cauliflower. Soak saffron in milk. Heat ghee in a pressure pan. 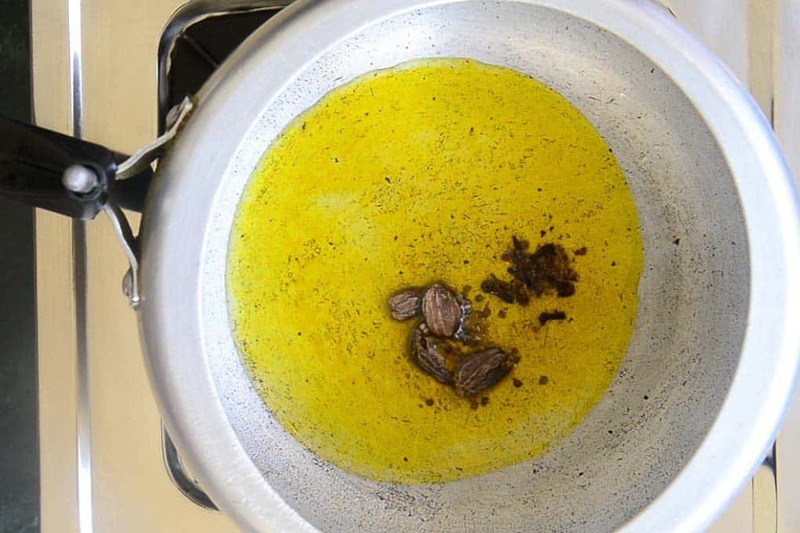 When the ghee is hot, add black cardamom, cloves and whole peppercorns. Fry for 10 seconds. Add whole red chilies, cumin seeds and asafoetida. Add the mutton and cook on high heat for 5-6 minutes, till it turns slightly brown. Now add ½ cup water and cook for 10-12 minutes on low flame. Whisk the yogurt with 1 tsp maida. Add Kashmiri red chilli powder, fennel powder, dry ginger powder, coriander powder, salt and milk with saffron. Mix well. Add the yogurt in the pan. Cook for a minute. Add a cup of water and cook the mutton for 1 and ½ to 2 hours till done. I pressure cooked it for 20 minutes on low heat. Pour the oil infused with ratanjot if available. Taste and adjust the salt. You can also add garam masala at this stage. Serve hot with steamed rice or Naan. Rogan Josh is a Kashmiri style Mutton (Lamb) Curry made with spices like fennel seeds and dry ginger. Soak saffron in milk . When the oil starts to fume, switch off the heat for a minute. Switch on the heat and add black cardamom, cloves and whole peppercorns. Now add ½ cup water and cook for 10-12 minutes on low flame. Whisk the yogurt with 1 tsp maida. Add Kashmiri red chilli powder, fennel powder, dry ginger powder, coriander powder, salt and milk with saffron. Add the yogurt in the pan. 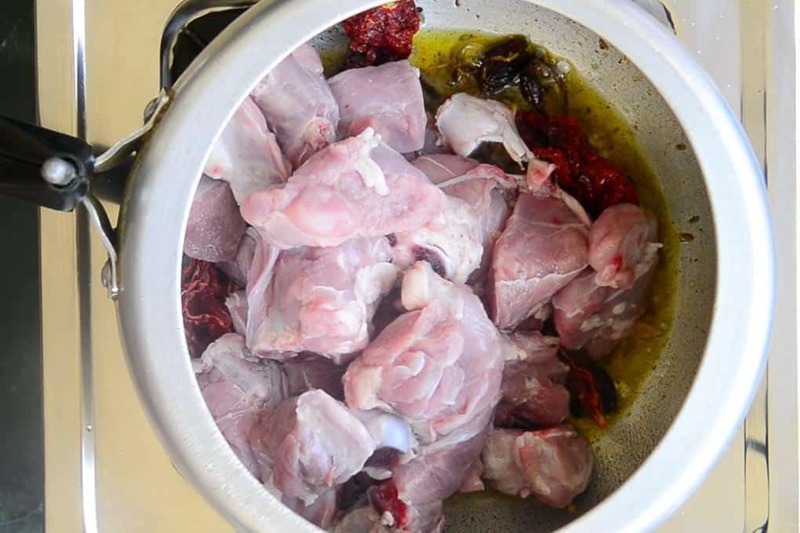 Add a cup of water and cook the mutton for 1 and ½ to 2 hours till done. I pressure cooked it in the pressure pan till done. Serve hot with steamed rice or Naan. Wow. Looks delicious. Nice recipe and very clear steps. Just made the recipe today! Followed the Muslim variation and it turned out extremely delicious.